^ 3.0 3.1 3.2 3.3 3.4 3.5 Intel Corporation 2016 Annual Report Form (10-K). EDGAR. United States Securities and Exchange Commission. 2016-02-27 [February 3, 2017]. ^ Intel 2007 Annual Report (PDF). Intel. 2007 [2011-07-06]. ^ Goodin, Dan. Microsoft's holy war on Java. news.com (CNET News.com). 1998-09-23 [2008-01-07]. ^ Graham, Lea. USA versus Microsoft: the fourth week. news.bbc.co.uk (The BBC). 1998-12-14 [2008-01-07]. ^ Brandz Ranking 2007. Millward Brown Optimor. 2007 [2007-07-28]. （原始内容存档于2007-08-04）. ^ Theo Valich. Secret of Intel name revealed. The Inquirer. 2007-09-19 [2007-09-19]. （原始内容存档于2012-06-29）. ^ A chronological list of Intel products. The products are sorted by date. (PDF). Intel museum. Intel Corporation. 2005-07 [2007-07-31]. （原始内容 (PDF)存档于2007-08-09）. ^ Marvell buys Intel's handheld processor unit for $600 million. eetimes.com (CMP Media LLC.). 2006-06-27 [2007-07-12]. ^ Maliniak, Lisa. Ten Notable Flops: Learning From Mistakes. Electronic Design Online. 2002-10-21 [2007-11-27]. （原始内容存档于2008-12-16）. ^ Dvorak, John C. What Ever Happened to... Intel's Dream Chip?. February 1997 [2007-11-27]. ^ Nicely, Dr. Thomas R. Dr. Thomas Nicely's Pentium email. Vince Emery Productions. 1994-10-30 [2007-07-12]. （原始内容存档于2007-07-24）. ^ Apple to Use Intel Microprocessors Beginning in 2006. Apple press release. Apple Inc. 2005-06-06 [2007-07-12]. ^ Bhagat, Nancy. Views@Intel - Sprinter Ad (Blog post). 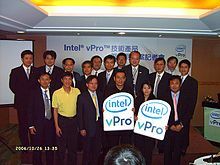 blogs.intel.com. Intel Corporation. 2007-07-31 [2007-08-09]. （原始内容存档于2007-08-20）. ^ MacDonald, Don. Apologies from Intel for Sprinter Ad. intel.com. Intel Corporation. [2007-08-09]. （原始内容存档于2008-02-02）. ^ Intel Board of Directors. [2007-09-15]. ^ iWon company profiles: Intel. iWon.com. IAC Search & Media. [2007-07-28]. （原始内容存档于2008-02-21）. ^ Patrizio, Andy. Big Intel Layoffs Could Come Next Week. internetnews.com (Jupitermedia Corporation). 2006-08-31 [2007-07-28]. ^ Intel Communities. Intel. Retrieved on January 23 2008. ^ Suh, Elizabeth. Home of Oregon's largest employer and much more. The Oregonian, October 28 2007. ^ Jobs at Intel - Diversity. intel.com. Intel Corporation. [2007-07-28]. ^ Jobs at Intel - Diversity, Employee Groups (Intel Muslim Employee Group). intel.com. Intel Corporation. [2007-07-28]. ^ Jobs at Intel - Diversity, Employee Groups (Intel Jewish Community). intel.com. Intel Corporation. [2007-07-28]. ^ Jobs at Intel - Diversity, Employee Groups (Intel Bible-Based Christian Network). intel.com. Intel Corporation. [2007-07-28]. ^ Hamidi, Ken. FACE Intel Index. faceintel.com. [2007-07-28]. ^ Fried, Ian. Intel, AMD sign new licensing deal. news.com.com (CNET Networks, Inc). 2001-04-04 [2007-07-28]. （原始内容存档于2012-12-16）. ^ Patent Cross License Agreement - Advanced Micro Devices Inc. and Intel Corp.. Findlaws, Inc. [2007-09-15]. ^ Intel Files Response To AMD Complaint. intel.com (Press release) (Intel Corporation). 2005-09-01 [2007-07-28]. ^ Whelan, David. Intel's Legal Strategy Takes Shape. forbes.com (Forbes.com Inc). 2005-09-02 [2007-07-28]. ^ AMD, Intel Battle Wages On As EU Decision Nears (PDF). amd.com. Portfolio Media, Inc. 2006-03-20 [2008-01-07]. ^ Krazit, Tom. Update: Intel issues formal response to AMD's antitrust lawsuit. infoworld.com (IDG News Service). 2005-09-01 [2008-01-07]. ^ Transmeta Announces Patent Infringement Lawsuit Against Intel Corporation. investor.transmeta.com (Press release) (Transmeta Corporation). 2006-10-11 [2007-07-28]. （原始内容存档于2007-05-01）. ^ Transmeta settles patent suit with Intel. reuters.com (Reuters). 2007-10-24 [2007-10-25]. ^ Competition: Commission confirms sending of Statement of Objections to Intel. europa.eu (Press release). 2007-07-27 [2007-07-28]. ^ Lawsky, David. UPDATE 4-EU says Intel tried to squeeze out Advanced Micro Devices. reuters.com (Reuters). 2007-07-27 [2007-07-28]. ^ 48.0 48.1 EU outlines Intel 'market abuse'. news.bbc.co.uk (The BBC). 2007-07-27 [2007-07-28]. ^ Lawsky, David. Intel says EU made errors in antitrust charges. reuters.com (Reuters). 2007-07-27 [2007-07-28]. 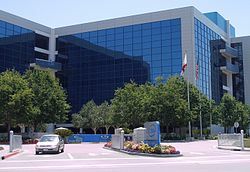 ^ EU regulator raids Intel offices. BBC News. 2008-02-12 [2008-02-12]. ^ Clarke, Peter. AMD sets up website to tell "the truth about Intel". eetimes.com (CMP Media LLC). 2007-08-08 [2007-08-09]. ^ AMD Break Free. breakfree.amd.com. 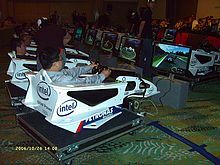 Advanced Micro Devices, Inc. 2007-07-31 [2007-08-09]. （原始内容存档于2007-07-31）. ^ Intel facing antitrust complaint in Korea. iht.com (International Herald Tribune). 2007-09-11 [2007-09-13]. ^ 09年末驚天新聞：傳INTEL準備收購NVIDIA. it168.com. 2009-12-09 [2009-12-11]. ^ 惊！Intel或收购NVIDIA 黄仁勋任新CEO. 中关村在线. 2012-12-15. ^ Trademarks and Approved Nouns List. [2018-01-12]. （原始内容存档于2012-12-18）.